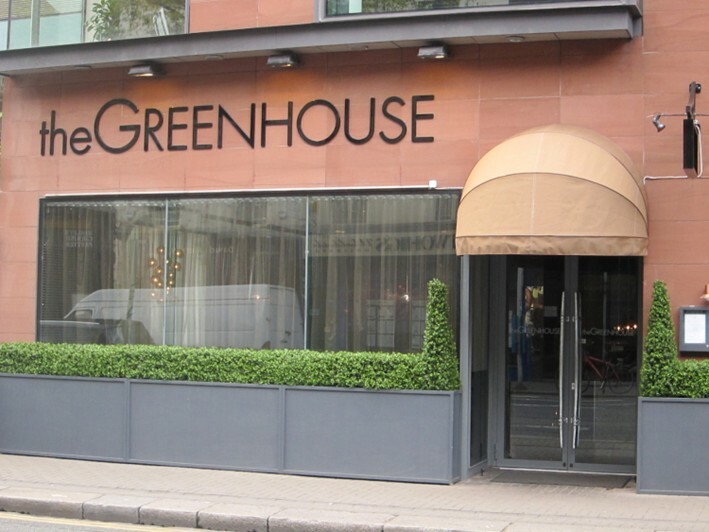 The Greenhouse is located in Dawson Street, just a few yards from St Stephens Green. 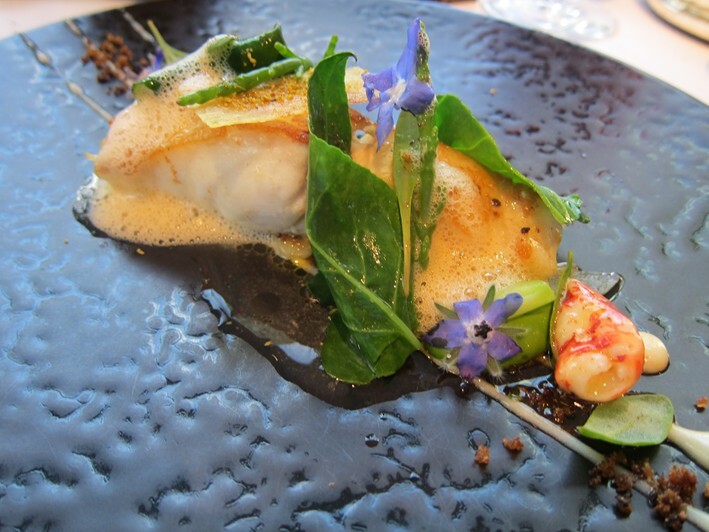 The restaurant opened in 2012 and has held a Michelin star since 2016. 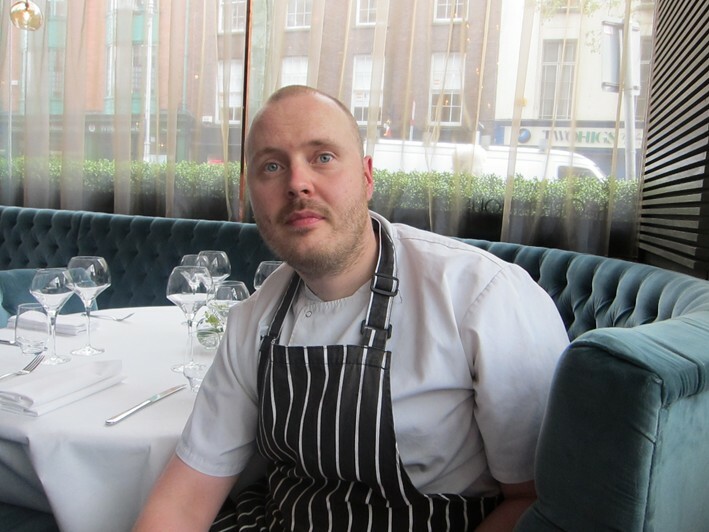 Finnish chef Mickael Viljanen was formerly head chef at a restaurant called PK's in Finland, and in Ireland worked with Paul Flynn at The Tannery in 2007/2008. 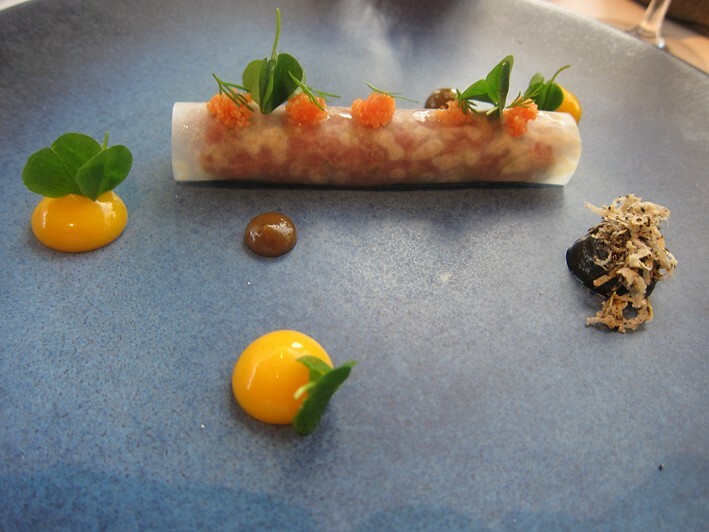 He was then head chef of Gregans Castle in County Clare for four years before opening The Greenhouse. 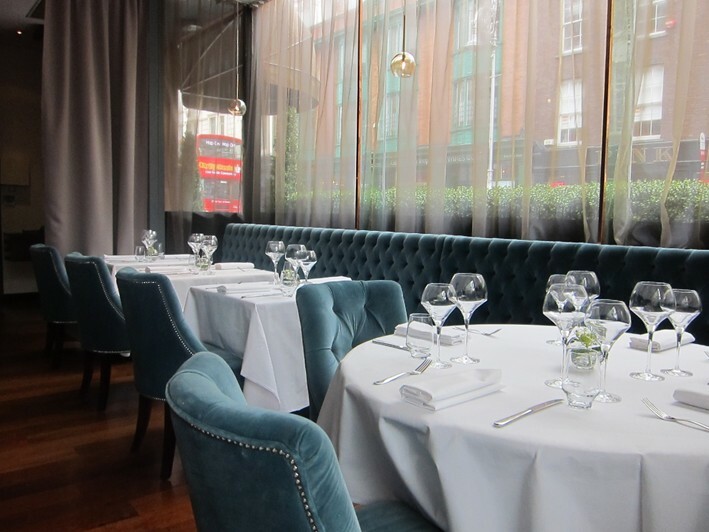 The dining room is light and airy, the tables covered with crisply ironed white tablecloths. 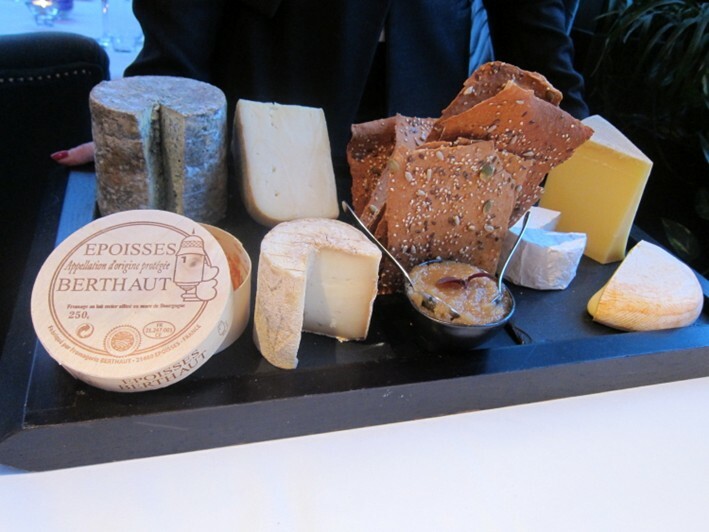 A range of menus was available, At dinner you could have a tasting menu at €90 (£80) for four courses or €115 (£102) for six courses. 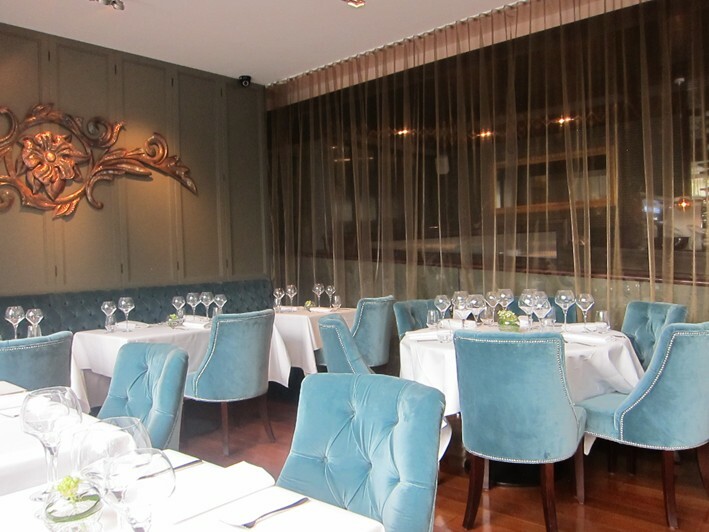 At lunch you could have two courses for €25 (£22) or three for €35 (£31), or a surprise five course menu at €75 (£67). The wine list had around four hundred references, with labels such as Domaine Cosse Maisonneuve Le Combal 2014 at €48 for a bottle that you can find in the high street for €18, Colome Malbec 2015 at €69 compared to its retail price of €22 and Moonlight Race Pinot Noir 2014 at €95 for a wine that will set you back €41 in a shop. At the grander end of the list you could indulge in bottles like Tenuta San Guido Sassacaia Bolgheri 2012 at €370 compared to its retail price of €193, or Vega Sicilia Unico Reserva Especial at €795 for a wine whose current market value is €396. Water was €6.50 a bottle. 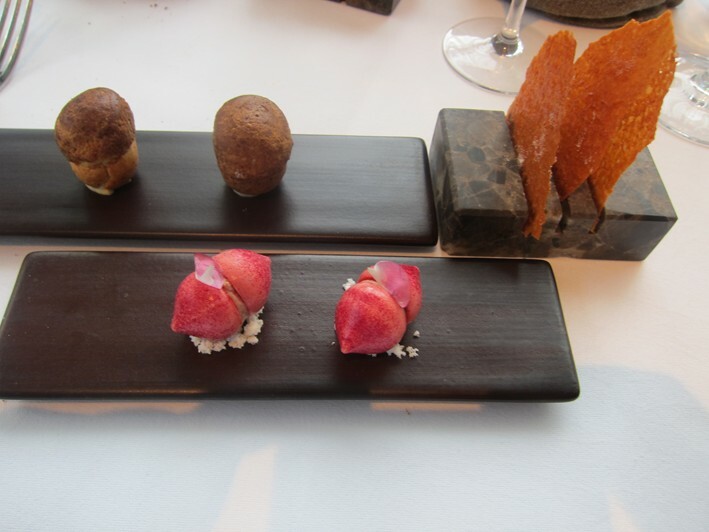 The meal today started with a trio of canapés. 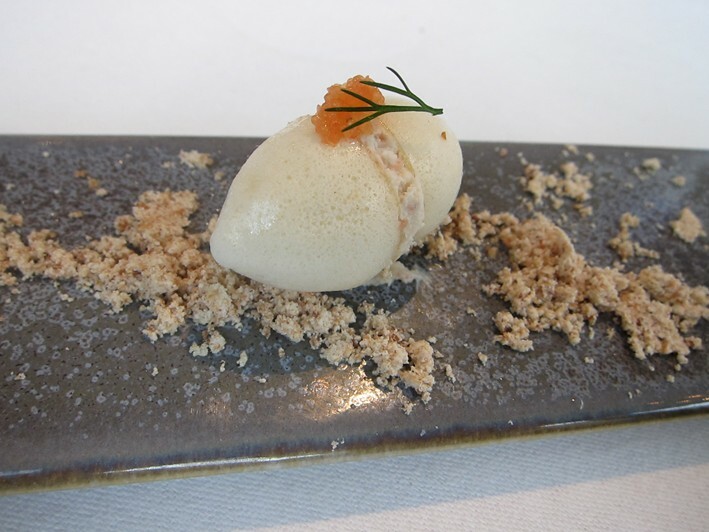 The first was a millefeuille of whipped turbot roe and potato with caviar. This was lovely, the roe rich and creamy in texture, being balanced by the earthy potato and brininess of the caviar (17/20). Next was a Lambay crab tartlet with basil emulsion, dashi and Cornue des Andes tomato jelly and espelette pepper. 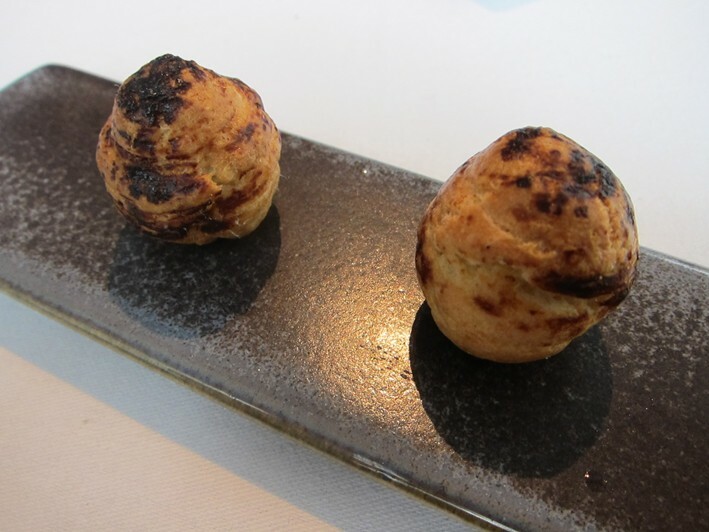 This was even better, the crab fresh, the pastry delicate, the gentle bite of pepper complementing the crab (18/20). 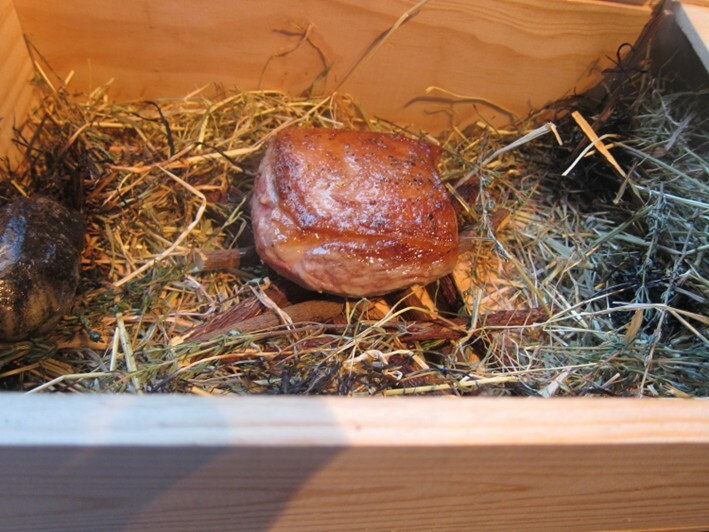 Also gorgeous was a warm beignet of pig head and lovage flavoured with truffle. 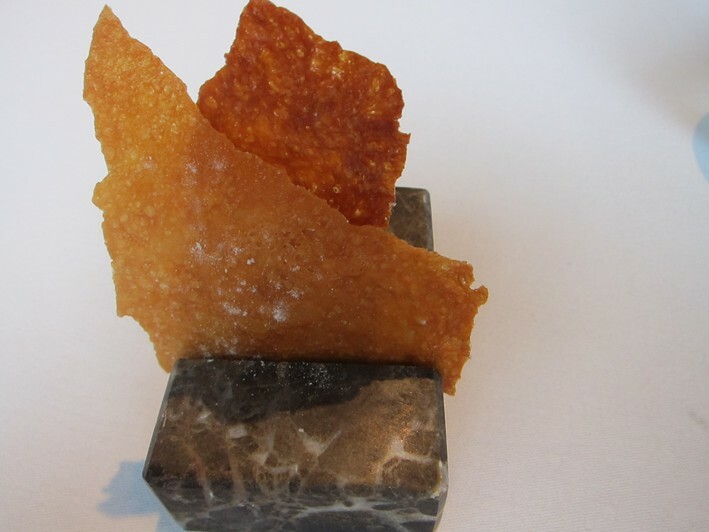 The rich, deep pork flavour was nicely balanced by the lovage and the aromatic truffle, the texture of the beignet being as light as you could wish (18/20). Sourdough bread was made from scratch in the kitchen and had a lovely crisp crust and airy texture, along with excellent butter from Glenilen Farm (17/20). 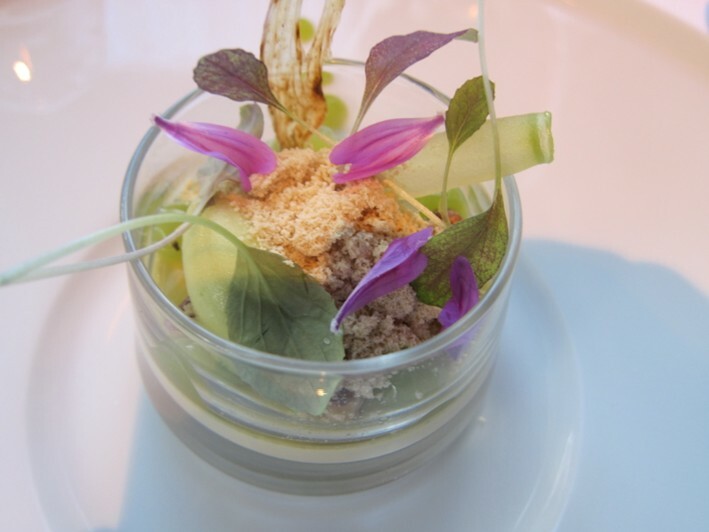 The first formal course was a signature of the restaurant, foie gras royale with smoked eel, candied walnuts and Granny Smith apple. 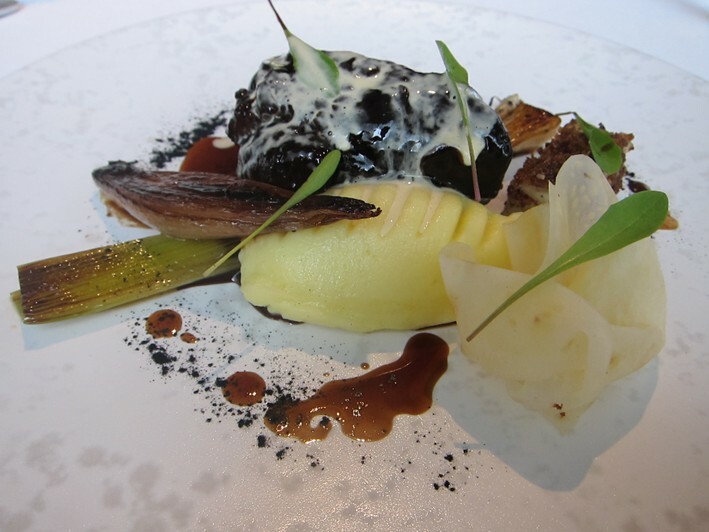 I have had this dish before but this time the foie gras has been upgraded to a superior version from the Landes region and is glorious, smooth and rich, complemented by the smokiness of the eel, its richness cut through by the acidity of the apple. 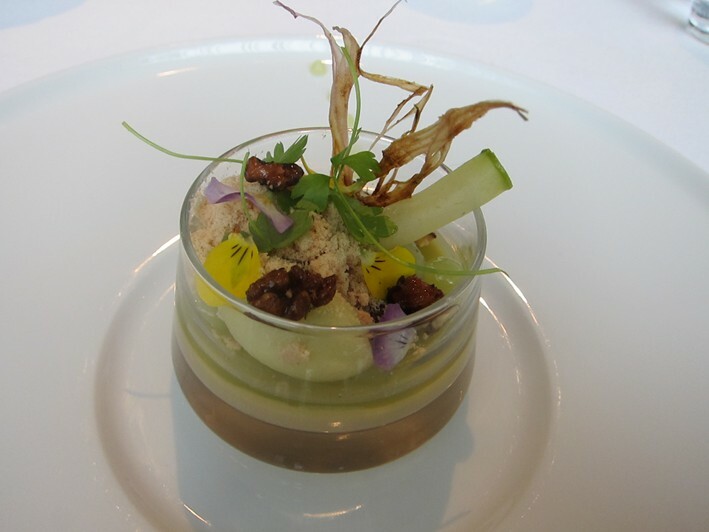 The blend of different textures was lovely, the crunch of the walnut contrasting with the silky smooth liver. A glorious creation that has been refined and perfected over time (easily 19/20). 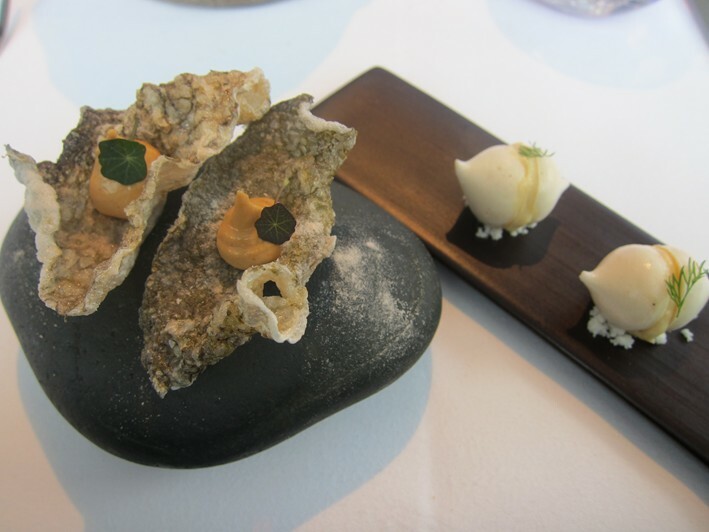 This was followed by small oysters from Flaggy Shore, along with Oscietra caviar and a hand dived scallop, all in a nage made using Chateau Chalon wine. 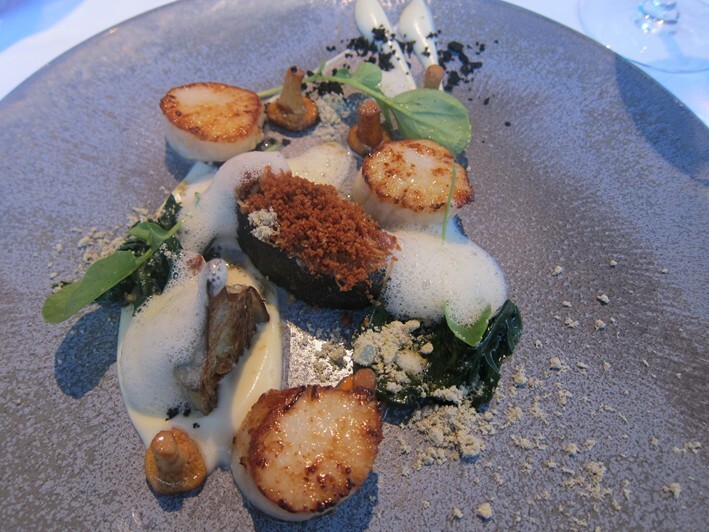 This was very pleasant, though I have had some remarkable scallops recently, so by comparison this was merely very good (16/20). This was followed by an impressive slab of turbot from a huge 8 kg fish (bigger is better when it comes to turbot), beautifully cooked and accompanied by broad beans, girolles, artichokes and anchovy butter. 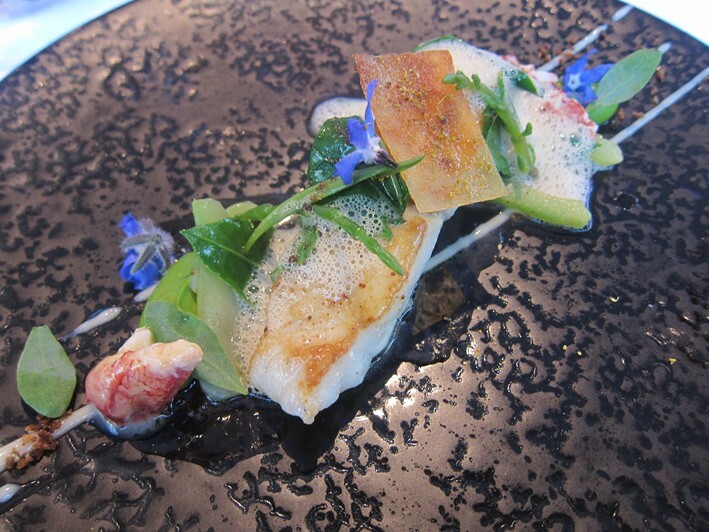 This was another impressive dish, the vegetables excellent and the turbot having lovely flavour (easily 18/20). 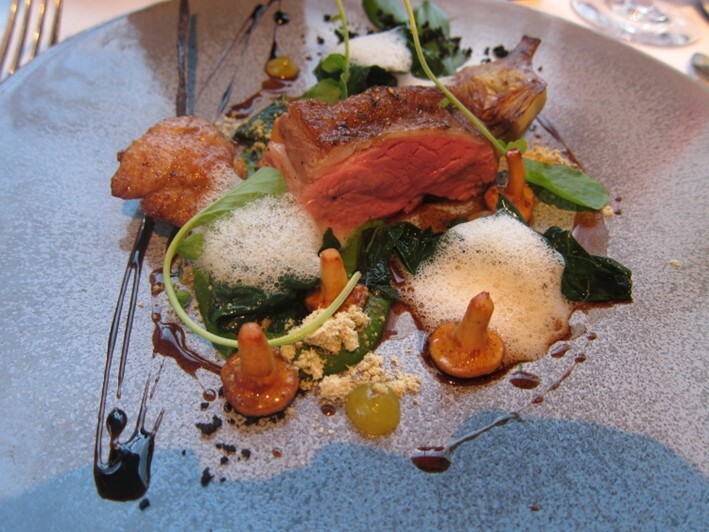 The main course was pigeon from Anjou, the leg and breast barbecued and served with beetroot, cherries from Ceret, black truffle, a bed of spinach and a rich truffle jus. The meat was lovely, its slightly gamely flavour enhanced by the truffle and balanced by the earthy beetroot and acidity of the spinach and cherries (strong 18/20). Raspberries from Tulameen came in a tart with caramelised honey cremeux, white chocolate and raspberry sorbet. 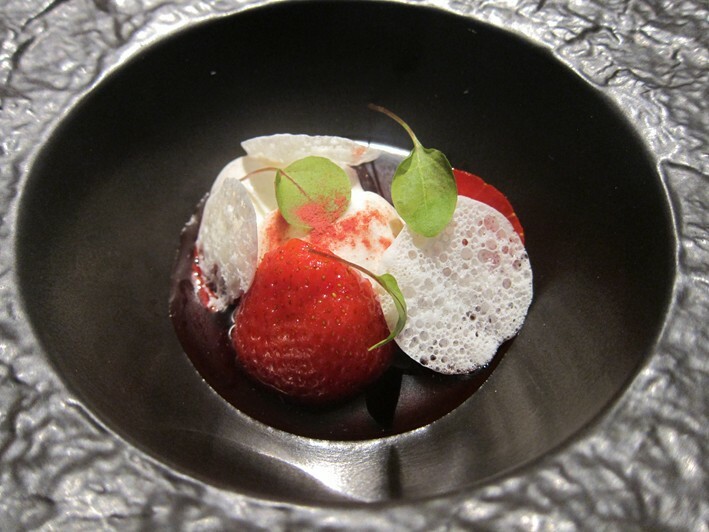 The fruit was ripe and had lovely flavour, the tart was delicate and the sorbet had intense flavour and smooth texture (17/20). 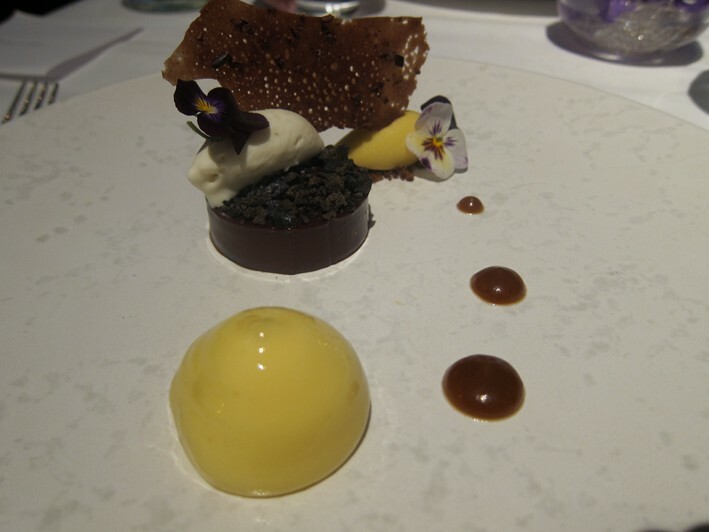 A further dessert was Valrhona chocolate and praline delice with coffee jelly, coffee liquor with a little yuzu for acidity, and a milk ice cream with Irish Sea salt, the dish completed by lacy chocolate tuiles. This was also very good, the gentle ice cream flavour a good pairing for the rich chocolate, the balance with the yuzu very good (17/20). Coffee was from a Nespresso machine, with a Brazilian coffee used for the espresso. 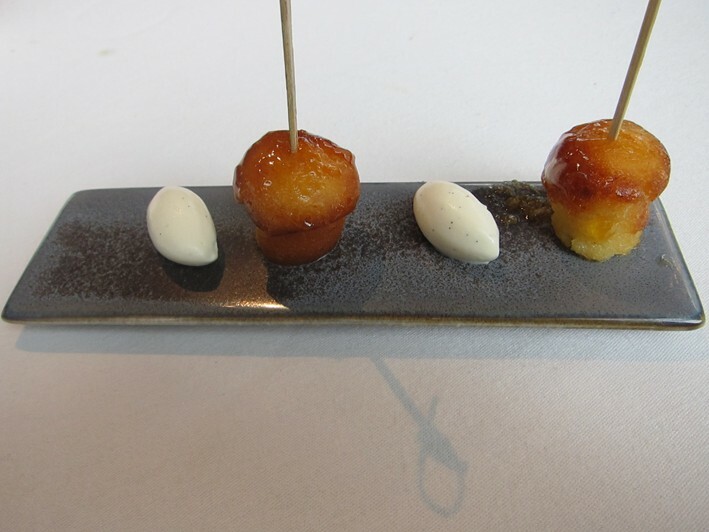 With this came a trio of capable petit fours: tart of citrus and jasmine, a canele and a choux pastry Paris Brest. The bill came to €119.50 (£107) with still water to drink but no wine. 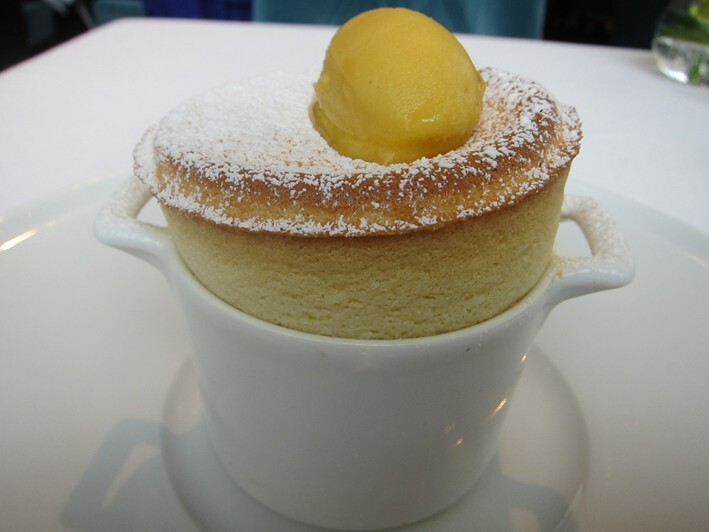 If you came for dinner and had the shorter menu and shared a modest bottle of wine then a typical cost per head might be around £120, though of course you could eat for less here at lunch. The average score of the dishes at this meal was over 17.4, so the overall score was only marginally a 17/20 rather than 18/20, a strong two star Michelin level performance today. 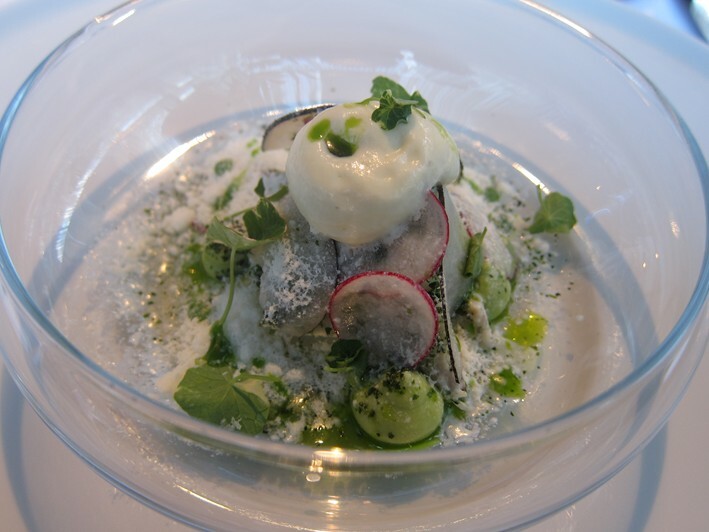 The Greenhouse is a terrific restaurant that just keeps improving. It knocks plenty of two star places around the world into a cocked hat.